Description: Treatment of an aromatic molecule such as benzene with sulfur trioxide and a strong acid leads to formation of sulfonic acids. Notes: Although H2SO4 is shown here, essentially any strong acid will do. Mechanism: This is an electrophilic aromatic substitution reaction and proceeds in two phases, the “activation phase” and the “substitution phase”. Treatment of sulfur trioxide (SO3) with strong acid (H2SO4) leads to protonation of the oxygen (Step 1, arrows A and B) making the sulfur a better electrophile than it was initially. The sulfur of the “activated” HSO3(+) is then attacked by a PI bond from the aromatic, leading to breaking of aromaticity and formation of a carbocation (Step 2, arrows C and D). Aromaticity is regenerated by removal of a proton, which leads to formation of the C1-C2 PI bond (Step 3, arrows E and F). Notes: Note that strong acid (H2SO4) is regenerated in this reaction. 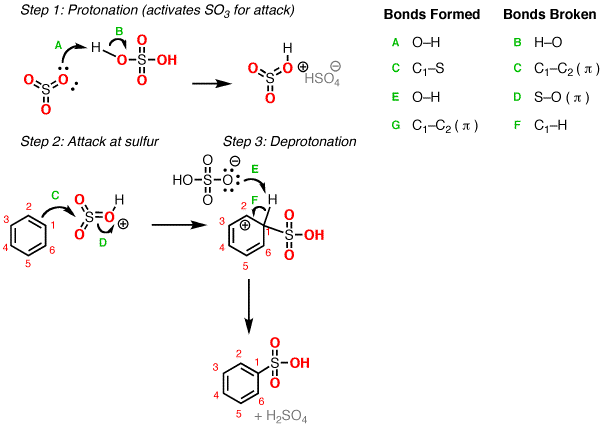 Note also that there are other reasonable ways of showing the deprotonation reaction besides using HSO4(–) as base. i want to prepare sulfonic acid at small scale industry.pl give us details. You should hire a consultant. Does sulfonation activate the ring for future electrophilic aromatic substitutions? Why does benzene pie attack the S? It already has 6 bonds? It’s not easy to do – but it happens. It’s much more difficult to perform this reaction on benzene than on an ordinary alkene. It’s usually important to heat this reaction. Since HSO4- is the conjugate base of a strong acid, how does it strong enough of a base to eliminate the proton (Step 3) to reform the aromatic benzene? I have seen a similar but different mechanism for this reaction that avoids this problem by initially having the pi bond attack SO3 rather than SO3H, resulting in an anion, at which point water acts as a base deprotonating to reform the aromatic system. This water is now a hydronium ion which is used to protonate the SO3- to become SO3H. How do I know which of these two mechanisms is correct? The proton in question is extremely acidic as its conjugate base is quite stable (it’s aromatic). If neutral water is present, then yes, neutral water would likely act as the base here. Protonation of SO3 to give SO3H+ accelerates the reaction considerably. The rate limiting step is not deprotonation, but attack of the benzene ring on sulfur.